I thought of just posting photos of food, but that would just be Instagram or Facebook, right? There is a rhyme to my reason, and that being said is to have this as part of my virtual memoir for my family. It’s part of that story where one of them is going to say ‘what was that awesome food Dad made that one day?’. That’s what this is about. This particular is only due to the fact that I went to Costco (yep) and purchased a crap load of cashews. Not only were they great sampling, hence why I bought them, but I figured I was going to create something out of them. When I brought them home, my wife started snacking on them, like her daily dose of almonds. 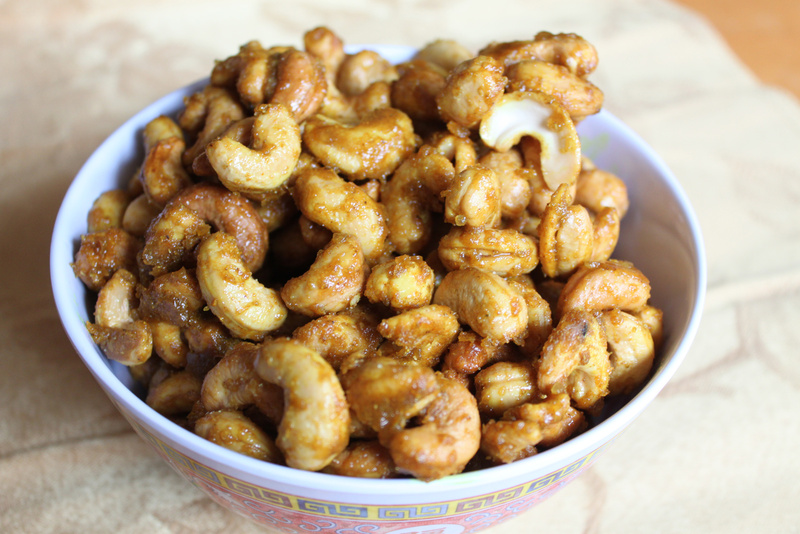 I knew I made the right decision, so when my family left to run errands, I decided to come up with a spiced up cashew snack that I knew she would love (my kids, not so much). Indian style spiced and glazed cashews that were addicting. Next, on a medium heat on a large skillet, add the butter, and sugar. Toss in the water and nuts and cook on medium heat for about 7 minutes. You want the water to pretty much evaporate, and the butter and sugar to caramelize those nuts. Excellente. Toss those suckers as well as you don’t want those cashews to burn. Adjust the heat as necessary but keep them from burning. 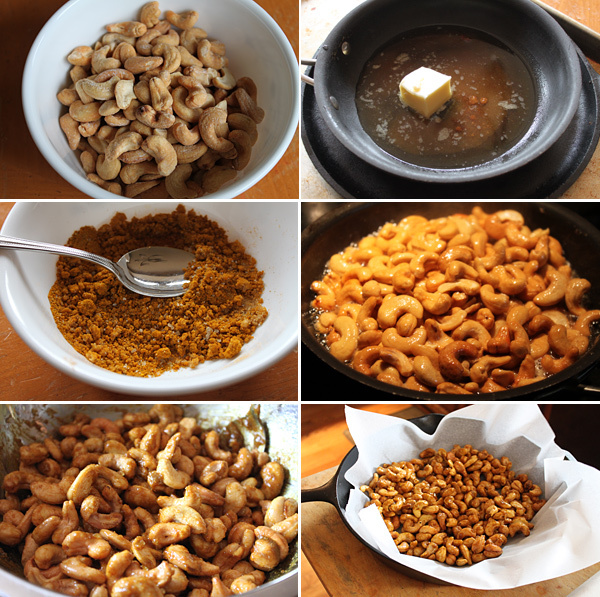 Once you have a great glaze on those cashews, remove them from the heat, and add them to a large bowl (or whatever holds the amount of cashews) and toss in the spice mix. Toss well, or use a spoon to make sure the glaze and spice gets all over those nuts. Line a baking sheet, or in my case a cast iron skillet, with parchment paper, and layer the spiced cashews. Place into the oven and cook for about 12-15 minutes or until they look delicious and you cannot wait any longer. You want to talk about great Indian spices, and an awesome nut, well sit around a small bowl of these and you have it going on. I hope you enjoy! I am definitely making these tomorrow. The mix of spices is unbeatable, and everyone in this house loves curry. Thanks for maintaining such a great food blog! Thanks for the great comment, Deborah. I hope you enjoy them!